Baselworld (Switzerland) is a global staging event held annually for industry watch, jewellery and precious-stone manufacturers to showcase their innovative novelties and creative jewellery designs. Baselworld, opens March 8 to 15, is anticipating 100,000 visitors, 3000 journalist and between 1800 to 1900 prestigious luxury vendors to bring their signature designs and exhibit in a spirit of ‘innovative show and tell,’ and Philippe Charriol is expecting to do just that. Philippe Charriol recently returned from Hong Kong where he showcased his latest Eau de Toilette perfume “Show Off,” at Harlan’s, a trendy western restaurant in The One Mall on February 16. It appears Charriol’s fragrance may suggest a subtle hint of his intent at Baselworld – to show off. Philippe Charriol plans to bring the ‘oh la la factor’ with modern introspective designs intertwined in classism and sophistication. Charriol has re-mastered his designs using new materials and vibrant colors; and Charriol’s patented Celtic cable design promises to feature a stunning new herringbone concept, called “Chevron” in French, new features include designs of the St. Tropez™, the Rotonde by Charriol™, the Parisii™, the Alexander™, and the Colvumbvs® models. Philippe Charriol is forging ahead competitively in men’s accessories, jewellery, eyewear, writing instruments and leather goods, establishing his brand as a trailblazer in the luxury goods and fashion industry. Last year’s Baselworld showcase was indeed an articulate display of this perfect marriage of classicism and modernity in which Charriol’s marked genius was exhibited when he presented both the Celtic XL Automatic and Celtica Chrono Stealth timepieces. Who knew Charriol’s patented cable designs re-visited and re-mastered could assert such glamorous and dramatic styling? Charriol of course. Looking to discover the current trends among the most renowned watch and jewelry brands in the world? Baselworld 2012, the world’s watch and jewelry show, brings about a unique global atmosphere with a business flair that will feature luxury Swiss watch brand Philippe Charriol. Philippe Charriol had a momentous and successful comeback to the show last year after the brand’s 25th anniversary. New managing and marketing director Ludovic Lesur, along with multiple brand agents, brought a new angle to the public presence of Charriol with the decision to attend Baselworld. Last year, Charriol unveiled the Celtic line of watches, a powerful collection that highlighted a new cable-themed motif, the herringbone, along with multiple other jewelry lines. The collections set for this year’s display have not yet been named, said simply to present creative redesigns of traditional watch lines, with one model in particular exhibiting the trademark Charriol cable theme. All of the collections display distinct characteristics from Philippe Charriol’s lifestyle, which is one heavily influenced by love for travel, sports and art. The brand’s artistic director, Coralie Charriol, also plans to reveal her recent jewelry designs, sophisticated creations that again implement the cable symbol. Philippe Charriol’s inspiration for the original Celtic collection came from his passion for art and history, drawing motivations from the Celtic culture itself. After he used gold or steel cable as a motif for watches and their bracelets in his premier collection, the concept was patented and Charriol has since held the sole rights over it. Baselworld features some 1800 companies from the watch, jewelry and precious stone industries each spring, attracting over 100,000 guests. The visitors generally hail from wholesale and retail trade sectors, but many are simply connoisseurs of fine jewelry and watches. The exhibition presents a setting like no other, where one can forge personal as well as business contacts while browsing the finest collections in the world. This year’s Baselworld showcase will run from March 8-15 in Basel, Switzerland. Planning to bring its best once again, the brand will take its former spot on the second floor in Booth 4.1, D07, Hall 4. Travelers new to Basel will find the transportation around the city most favorable, as the Swiss region has an effective and tightly bound public transport network. Train, air, and automobile all can take you quickly to your destination: The international Euro Airport sits a few minutes away from the center of the city, three train stations connect to key cities in Europe, and Baselworld will provide shuttle buses at your convenience. After a successful turnout during last year’s watch and jewellery show, Philippe Charriol will join Baselworld 2012 from March 8th to the 15th in Switzerland to launch a new watch and reinterpretations of its watch collections. At this year’s show, Philippe Charriol will present reinterpretations of some of its basic watch collections through innovative models based on new designs, materials and colors. 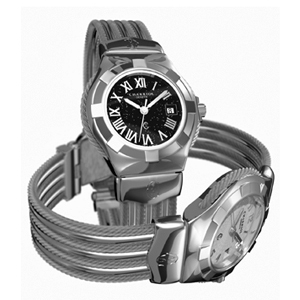 The Swiss luxury watchmaker is also planning to unveil a new timepiece that features the Charriol patented cable motif. 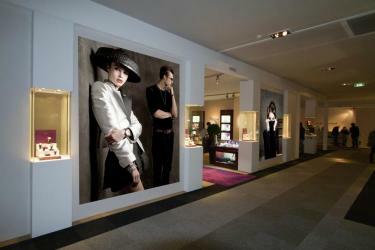 All of the collections symbolize the heart of the Swiss brand and follow the passion for sports, the arts and travel. 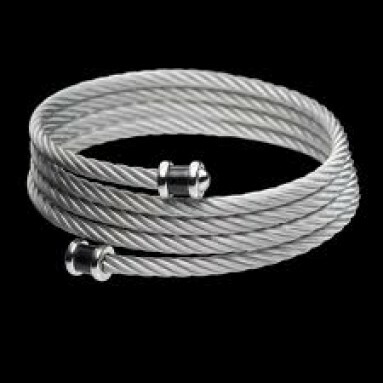 The company’s artistic director, Coralie Charriol, will launch her newest jewellery creations at the show as well, featuring the signature cable concept with a modern, elegant look. Philippe Charriol unveiled its new line of Celtic watches, including the Chrono Celtica and the fourth generation Celtic watch at the 39th Baselworld watch and jewellery show last March. The company also launched new jewellery lines, all of which focused on the “cable” theme. Last year, nearly 2,000 watch and jewellery producers and representatives, over 100,000 watch and jewellery fanatics and 3,000 journalists attended the show, making it the world’s leading show for the industries. A slew of exhibitors from over 45 countries unite to showcase their latest products in the watch and jewellery industry before experts, mass media representatives, collectors and enthusiasts at the show each year. As there are so many products to be displayed, the exhibition covers a broad area with numerous halls on several floors. The show also provides a market overview in addition to the showcases, offering attendees the ability to discover new opportunities and business partners. With thousands of visitors and participants from the watch and jewellery industry, the show acts as a prime networking event for the latest trends and styles in the fashion world. The history of the show travels as far back as 1917 when a section for watches and jewellery was created at the first Schweizer Mustermesse Basel. In 1972, the show’s exhibition acted as a meeting place for European countries France, Italy, Germany and the United Kingdom. From that point on, the show has grown substantially and continues to exhibit some of the world’s most prestigious lines of luxury watches and jewellery. Since 1983, Philippe Charriol has pioneered the designs of the arts and civilization into a collection of timepieces. The Swiss brand crafts products through the concept of elegance, sophistication and modernism, all of which add to the focus of Baselworld. Philippe Charriol will be present at BASELWORLD 2012, the World Watch and Jewellery Show from March 8 – 15. 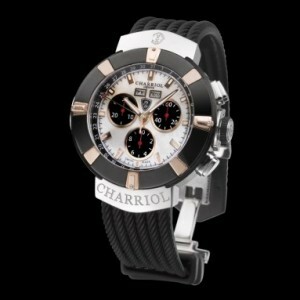 CHARRIOL will be introducing an extensive selection of their new models, along with the début of a new watch. 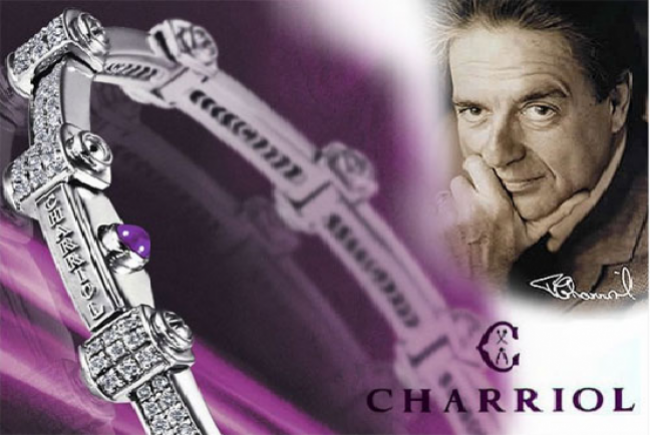 For those unfamiliar with CHARRIOL, the brand was founded in 1983 by Philippe Charriol. Philippe, being a lover of the arts, began his first watch collection from his appreciation of the Celtic culture and aptly named it the Celtic Collection. Philippe was a pioneer in the field of gold cable as an ornamental style for his watches. This exclusive technique of combining gold or steel cable became his “signature” and CHARRIOL now owns worldwide rights to this exclusive idea. To have a hint of the mindset behind a Swiss CHARRIOL luxury watch, Philippe described his brand as a marriage of classicism and modernity together with quality. And with over 3,000 distribution sites world-wide, his brand has certainly found an audience. BaselWorld is a yearly event held in Basel, Switzerland each spring where watch and jewellery companies come together from around the world to network and showcase their new collections to the specialty retail and wholesale market. It offers a glimpse of what the watch stores plan to stock for the coming year. Last year’s show, their 39th, touted over 100,000 visitors and over 1,800 exhibitors. Companies were optimistic for the future and the recovery of the economy when the rise of exports showed an upturn. 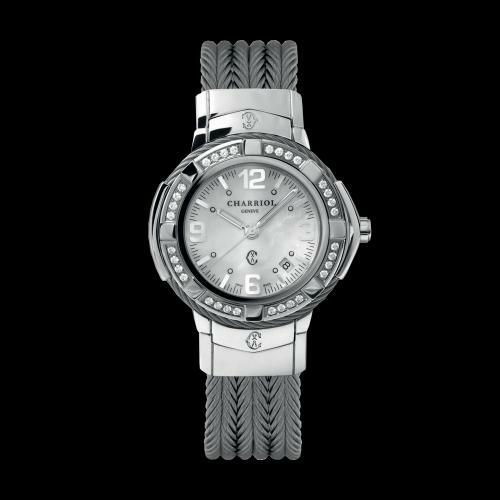 For 2012, CHARRIOL plans to showcase some new designs of current timepieces, for the show, with fresh colors and materials in line. Popular materials used last year by watchmakers to help keep prices down were ceramic, titanium, carbon fibre, and rubber. The variety of designs and materials (bracelet, cable motif with gold, silver, or bronze-plate) make choosing a CHARRIOL watch a process of personal tastes. BaselWorld 2011 was seen as a year of traditional designs and smaller dials. Nothing too outrageous or crazy; the theme seemed to trend towards “less is more.” Perhaps watch companies felt the pulse of the economy and held back. After all, if the most beautiful timepiece ever made won’t sell, it’s not good for business. It will be interesting to see the theme for the BaselWorld 2012 show. Will watchmakers make any bold moves this year? Only time will tell. But no matter what, CHARRIOL is sure to impress with their legacy of timeless elegance, classic beauty, and endless quality. Who ever said watches can’t be hot, has clearly never been to Panama. Philippe Charriol hosted an event in Panama during the late months of 2011 showcasing his watches on attractive locals. Four stunning Panamanian ladies participated in a photo shoot for the official launch of Charriol’s newest watch and jewelry collections. On staff at the gala affair was famous Panamanian fashion photographer, Dario Moreno. He photographed different women, with different styles, accentuating how each unique Charriol watch works with a different look. Of the four lovely women chosen were two TV hosts, a News Anchor and a Media Personality. These ladies became the first Philippe Charriol ambassadors to Panama, and, were given, of course, complimentary Charriol luxury watches. The event was held in honor of Philippe Charriol’s newest line of watches and jewelry at the luxurious Trump Ocean Club Hotel. The Trump Ocean Club Hotel. This top rate hotel speaks for itself, and was the perfect setting for Charriol’s high-end launch party. Toward the end of the evening, Charriol’s launch line was presented by his daughter, Coralie Charriol, and the artistic director of the brand to a VIP press audience. The privileged guests who got the sneak peak were allegedly awed by this beautiful collection. The Philippe Charriol brand recently turned 25. Its success as a company thus far has promoted its expansion throughout the world – from Europe to the Americas, and most recently Southeast Asia. 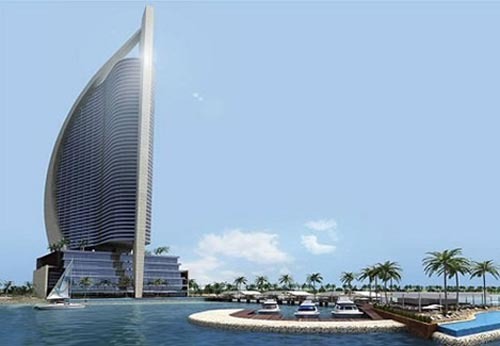 Its new ambassadors in Panama make a dazzling contribution to the brands successes and notoriety on a worldwide scale.